Search Dog Foundation told the family that everything that made Riley a handful as a house pet gave him enormous potential as a search dog. Riley was a real handful. The rambunctious puppy would bowl the children over, and he had altogether more energy than his family could cope with. He’d already been given up once. His previous family, an elderly couple, just hadn’t been able to cope with him. When they got sick, they’d surrendered Riley to a California rescue group, who had placed him with his new family. And the new family didn’t want him to be given up a second time. While trying various obedience and training classes, they came across Kate Davern, who trains dogs for the Search Dog Foundation. Davern told the family that everything that made Riley a handful as a house pet gave him enormous potential as a search dog. The family agreed that this would be the best thing for their dog, and he was adopted by the Search Dog Foundation. 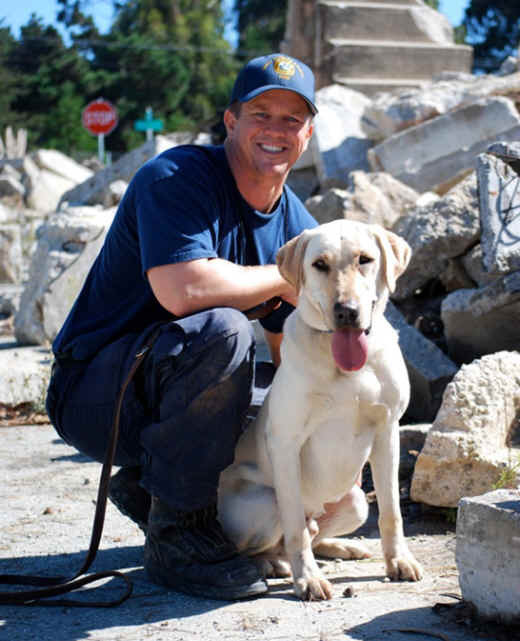 A few months later, in October 2009, Riley was paired with Eric Gray of the Santa Barbara Fire Department, and seven months later, he and his new partner received FEMA Certification. Riley was ready for action. Riley and Eric Gray at their graduation. 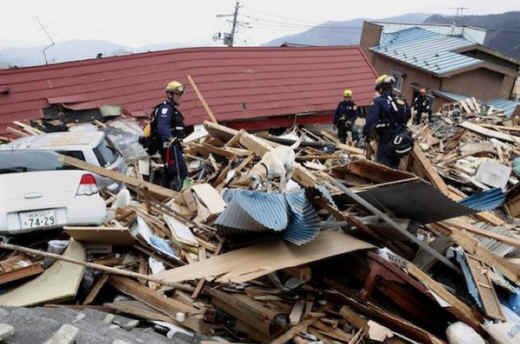 On March 11, Eric and Riley deployed to Japan as one of six Canine Disaster Search Teams trained by the Search Dog Foundation and mobilized by USAID to comb the wreckage left by the earthquake and tsunami. Based in Ojai, Calif., and founded by retired schoolteacher Wilma Melville, the Search Dog Foundation recruits dogs from shelters and rescue groups and sponsors their training for search and rescue. Since it began in 1996, Melville’s organization has provided 74 search teams to state search-and-rescue departments across the country. They work locally, nationally, and when necessary, internationally. While most of us assume that the main work of the dogs is to find survivors, an equally important part of their mission is to “clear” whole areas so that other rescue teams aren’t wasting time searching through wreckage where there’s no one to be found. In Japan, there were very few people to be found in the widespread devastation of the tsunami. So the crucial work of the dogs was to clear as many areas as possible as quickly as possible. Riley works with Eric in Ofunato City.